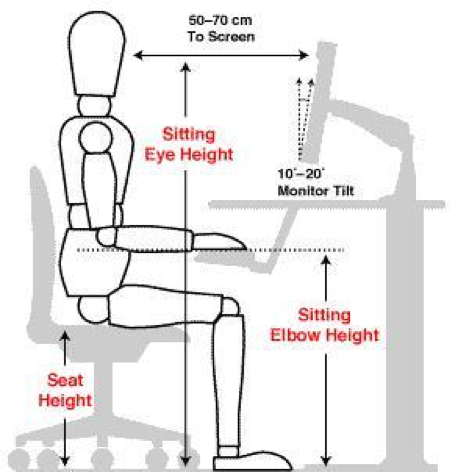 Adjust your chair height so that as you rest your hands on your keyboard your forearm is horizontal and your elbows are vertically below your shoulders. Your feet should be flat on the floor (a foot rest can be used if they are not) your knees should be level with or just below your hips, adjust your backrest to support your lower back. Your eyes should be level with the top of the screen (avoid looking down) lift the monitor if needed. The monitor should be approx. 50-70cm away from your eyes. Position any additional equipment on your desk e.g. telephones, paper trays in accessible places and try to avoid reaching and twisting.